Based on a true historical event, beginning on July 28, 1856, TRUE SISTERS is an illuminating and touching tribute to the amazing endurance of the human spirit in the face of unimaginable hardship. "This talented storyteller presents a riveting tale of hardship and faith as she braids together the lives of these female pioneers. 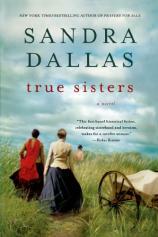 Complete with unexpected plot twists, TRUE SISTERS is an irresistible page-turner. (Just wait until you read the very last sentence of the book --- it is perfect.)" Two sisters wait impatiently to begin the journey they've traveled from their home in Scotland to undertake. Ella and Nannie, along with Ella's husband, Andrew, are Mormon converts embarking with others to immigrate to Salt Lake City, Utah. They are part of Brigham Young's plan to encourage an influx of faithful Latter-Day Saint settlers to their promised land. The settlers start in Iowa City, where they acquire two-wheeled handcarts. They will walk the 1,300 miles, pushing and pulling handcarts filled with their belongings across prairies, through rivers, and over mountains. Since the pioneers are not dependent on expensive wagons and animals, even the poorest of them can afford to buy a cart for the trip. Ella is pregnant with her first child, but is assured by the leaders that other expectant mothers have successfully followed the trail. Back home, Nannie was engaged to Levi Kirkwood, only to have her heart broken when she received a letter from him on their wedding day, telling her he was to marry another woman. Unhappily, she spies Levi and his new wife, Patricia, in the gathering with the other Saints in Iowa City. She is humiliated to discover that they also will be part of the cart procession of the Martin Company (named for the leader of the group, Mormon missionary Edward Martin). Ella comforts her sister, promising her joy when they reach "Zion" and assuring her that she will meet a man there who is worthy of her love. On this July day, the women are eager to get started on their journey. The 650 emigrants of the Martin Company are the last of five handcart groups to cross to Salt Lake that year, and they are three weeks past their original start date. Other things haven't gone according to plan. There were to be handcarts waiting for the Saints when they arrived from Europe, but instead the men had built handcarts themselves from the only available wood --- poor, unseasoned lumber. They were also promised plentiful wagons for travelers unable to walk, so they are dismayed to find there are only seven wagons for the hundreds of travelers. Those wagons are also filled with supplies. However, they trust the elders who tell them that God will give them strength on their travels. Finally, at last, Ella and Nannie hear shouts and the creaking of the first carts. Their journey has begun. Anne Sully is also impatient. She can't believe that, after waiting so long to begin their trip, the first day ends so quickly. Anne is pregnant, with a four-year-old and a two-year-old to tend. She is not a convert and feels she has been tricked by her husband, John, into taking the trip. On the ship over, Anne suffers a terrible tragedy. She feels intense resentment toward John for forcing her to leave a happy, comfortable life in London. They argue bitterly, but she is tired of quarreling and is now resigned to this trek to Zion. Louisa Tanner is newly married to the charismatic Mormon leader Thales. Her new husband tells her he has broken rules by marrying a new convert, but that he couldn't resist her. Louisa's family, including her elderly parents, sister and nephews, are traveling with them to Salt Lake City. Although Louisa knows that many find Thales to be overly proud of his connections with Brigham Young and Joseph Smith, she is thrilled with his prominent Mormon contacts. However, she is horrified with the way Thales reacts to her family's proposed change of plans. Louisa's friend, Jessie Cooper, is also part of the Martin Handcart Company. Jessie is a sturdy farmer who is traveling with her brothers, Ephraim and Sutter. Back at home, Jessie realized she was being courted by Thales Tanner. While she was grateful to him for leading her to the church, she disliked him personally and discouraged his romantic attentions. Jessie was relieved when Thales and Louisa became a couple. She and her brothers intend to start a farm in Zion. She glories in the walk ahead of them, never guessing the agonies that are in store for the Martin Company.